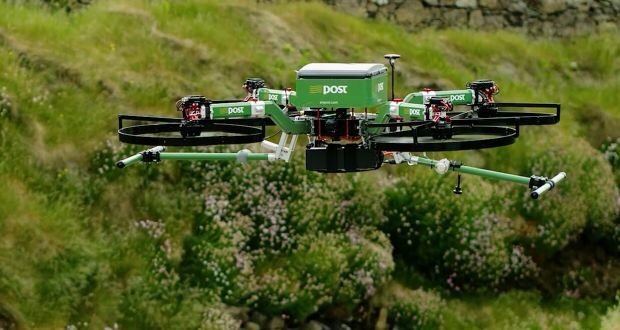 From September 2 to September 5, Posti (a Finnish postal, logistics and e-commerce services company) will be testing the use of unmanned aerial vehicles (UAVs) /delivery drones for the first time in Finland in what might also be considered the first European trial in an inhabited urban environment. Flights will depart from the observation deck of the Verkkokauppa.com store at Jätkäsaari up to 3x per day. The drone will fly beyond visual line of sight (BVLOS) of its operator however a special landing site has been cleared at the island of Suomenlinna. Next Eagle UAV from Sharper Shape Ltd.
Robotic helicopter or Remotely Piloted Aircraft System (RPAS) based on a laser-based observation system to prevent collisions and maximize safety. Only parcels under 3 kg (6.6 lb) from Verkkokauppa.com (a very popular online store in Finland). A 4 kilometer (2.5 mile) route between the island of Suomenlinna (a UNESCO World Heritage Site) and Helsinki in the Finnish mainland. Not specified, however the original Finnish article (http://www.posti.fi/lennot/) does mention the trip will only take 10 minutes. Thus, assuming the 4 kilometer (2.5 mile) route is only one way, this would mean flight speed is 24 km/hr (15 mph). What are your thoughts on this Finnish eCommerce Delivery Drone Trial? Comment below!